باقرشاهی, علی نقی. (1389). Neo-Platonism , Meeting Point of Mutahhari and St.Augustine in their Treatment of the Problem of Evil. دوفصلنامه جاویدان خرد, 07(17), 41-56. علی نقی باقرشاهی. "Neo-Platonism , Meeting Point of Mutahhari and St.Augustine in their Treatment of the Problem of Evil". دوفصلنامه جاویدان خرد, 07, 17, 1389, 41-56. باقرشاهی, علی نقی. (1389). 'Neo-Platonism , Meeting Point of Mutahhari and St.Augustine in their Treatment of the Problem of Evil', دوفصلنامه جاویدان خرد, 07(17), pp. 41-56. باقرشاهی, علی نقی. Neo-Platonism , Meeting Point of Mutahhari and St.Augustine in their Treatment of the Problem of Evil. 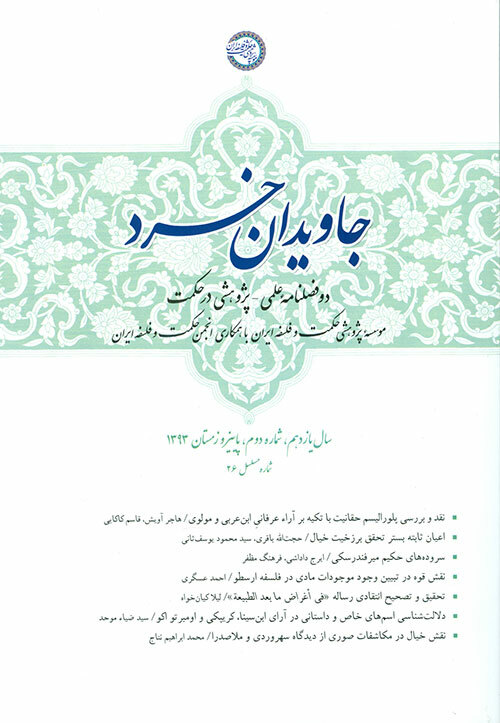 دوفصلنامه جاویدان خرد, 1389; 07(17): 41-56.